Home Politics Senator Ekwunife met with zonal coordinators in Awka. Senator Ekwunife met with zonal coordinators in Awka. 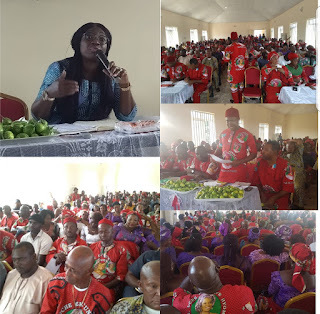 Senator Uche Ekwunife on Wednesday, 15th August met with the zonal coordinators of her Campaign Organization in Awka, Anambra State. At the event which held at Senator Uche Ekwunife Campaign House Awka, Senator Ekwunife thanked her teeming supporters, particularly her Local Government and Ward Coordinators whom she described as her "stronghold" for the immeasurable support they have given her over the years. She described the political terrain as one that requires a dedicated and committed support base, which she, by the grace of God is priviledged to have. She stated that the cardinal reason she has remained in politics is to bring the dividends of democracy to the grassroots and stressed the need for the people of Southeast to take a firm and collective political stand in 2019. “Our People must not be left out in National politics. This is why some of us are supporting President Buhari’s second term bid. Experience has taught me that interests play a leading role in politics. Our interest as Ndi Igbo is to produce an Igbo President in 2023. Therefore, in addition to the commendable work being done by the Buhari Administration in developing all sectors of the Nigerian economy, we strongly believe that the fastest and surest route to achieving an Igbo Presidency in 2023 would be to support President Buhari and the All Progressives Congress (APC) in the forthcoming elections”.